Outdoor advertising, or billboards as they are more commonly known are everywhere. They constantly bombard us with messages to buy. They are in some ways a reflection of our society and economy. In fact, the outdoor advertising industry's own trade publication is called Signs of the Times. With this series of photographs, I am exploring what these signs say about us or to us when they are empty. 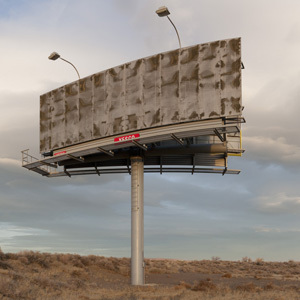 Is a blank billboard an advertisement for an economic decline? Or is it a minimalist object whose message is only that which viewer brings to it?